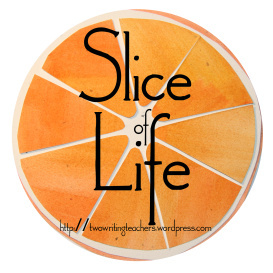 Slice of Life: Day 1 of 31! Today I’m starting my first ever daily Slice of Life March Challenge. The March Challenge is to write daily, a slice of life, everyday on my blog. slices of my life as I know it right now. The process of writing the weekly slice has been…important. As the day to slice approached I usually was little confused or perhaps worried about what to write, but I almost always left each slicing day wanting to write another, seeing slicing possibilities all around me. RIght now I’m wondering, as I suppose all of those who are jumping in to slice daily, how will this go? Right now my heart is full, pounding. There is so much. When I have time and energy I suspect they will be longer, like today. And when I don’t have either, they will be shorter. That will be the trick! Being on the West Coast many of the lovely Slicers have got their posts up and I want to read but first, first here’s my first slice of the month. Yesterday we had weather. This is a big deal Southern California. When it rains people have trouble. We’re not used to it. We forget how to drive, how to dress, how to live. Children are tossed into an unexpected, unfamiliar world and it’s exciting. There are puddles and rain boots. Going to the bathroom presents opportunities to step outside into the coolness. The gutters are filled and water drips down. Before recess the sun breaks and huge puddles, mini lakes have formed. We can splash. We open our mouths and dip our heads back with our arms outstretched soaking up all we can. We stand under the rain gutters and collect rainwater in plastic baggies. The cool air hits us after the steamy classroom. We want to run but no, no, only walking it isn’t safe they say. The week was good but extremely busy. I felt like I had gotten through two weeks in two days. A parent workshop on Thursday night left me tired and a bit unplanned for Friday morning. On our agenda I have one thing written: Vocabulary. Shouts erupt. They have opinions. We settle and take a quick, silent, yet visible vote. The readers win. The writers are a bit peeved. Interesting I think. 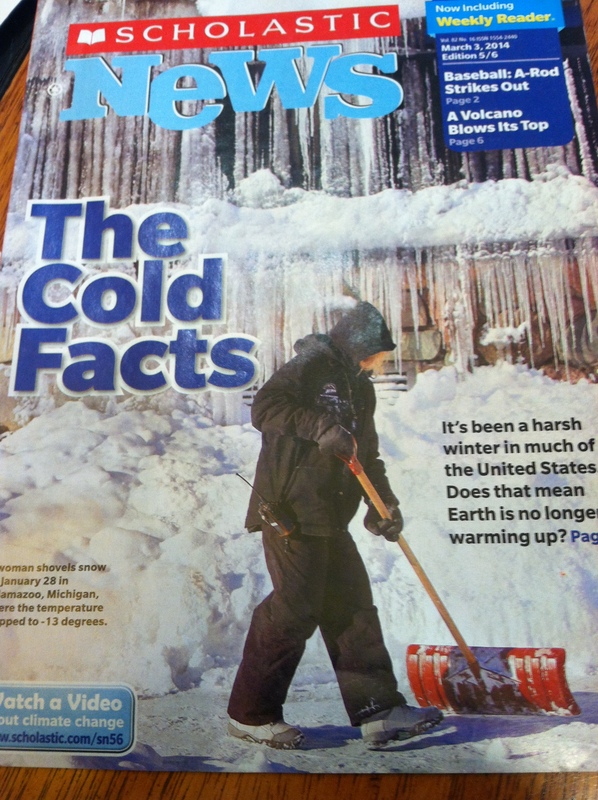 Read the cover story I tell them and see what the rest of the world deals with weather wise. After reading this kind of text we typically would break up into groups or partnerships to discuss, but today I wanted a little fun in the formative assessing. 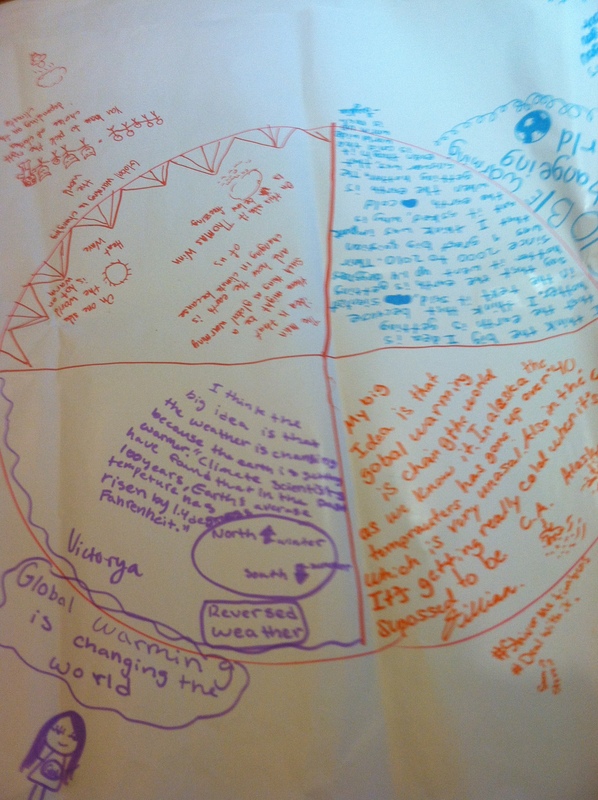 I gave groups a chart sized paper with a circle drawn in the middle. Each student got a different colored marker. Right there they were in heaven. COLORED MARKERS and A BIG WHITE PIECE OF PAPER!!! Their mission was to huddle around the paper and silently, individually write their thoughts about this question — What is the main idea the author wants you to learn from the article? Then after all were done they were to share, compare, and come to a consensus. The outcomes were hugely instructive. Watching them write their initial thinking and then listening to their discussion and where they took it was fascinating. Did they see differences or commonalities in thinking? What did they do after that? I ask the time old: What is the article mostly about? Perfect a topic to build on, I think. “And what about the that topic,” I ask. “Ok so why is that?” I ask. They pause. Look at each other. I point to the article, why don’t you look back at the article and ask that question I say and walk away. They went back to the text and discussed, that was the idea. In the end I got big evidence of their thinking and something to study this weekend. Those that were starting to get it. Those that are not there, YET. Weather. It’s different for us and it brought out a lot of different things yesterday. The wet heads, clothes and umbrellas. The passionate readers, writers, and the thinking amidst the colored markers. My favorite part of this post is the last caption – Those that are not there, YET! That one little word makes such a big difference. I am sure you will help them get there! 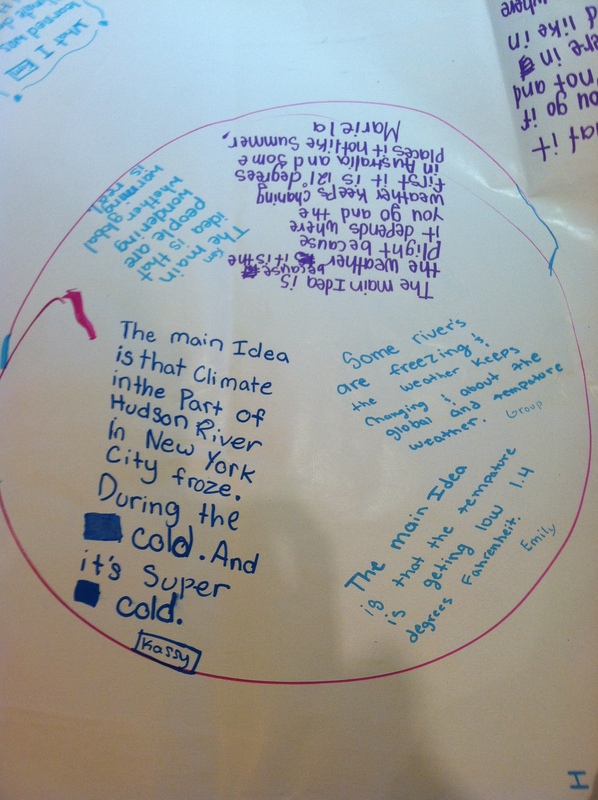 I did something similar using consensus boards with our persuasive writing. I love using this as a method of inquiry into something new. Great post! I know what you mean about the rain as a fellow Southern Californian. It was a bit wild for us yesterday, wasn’t it? 🙂 What a timely lesson with a nice strategy twist. Welcome to the March challenge this is my third year and I discover something new each time. I am excited for you because you are just starting on this road of writing discovery. Happy trails. Well, they got that it is freezing cold – that’s entirely correct. 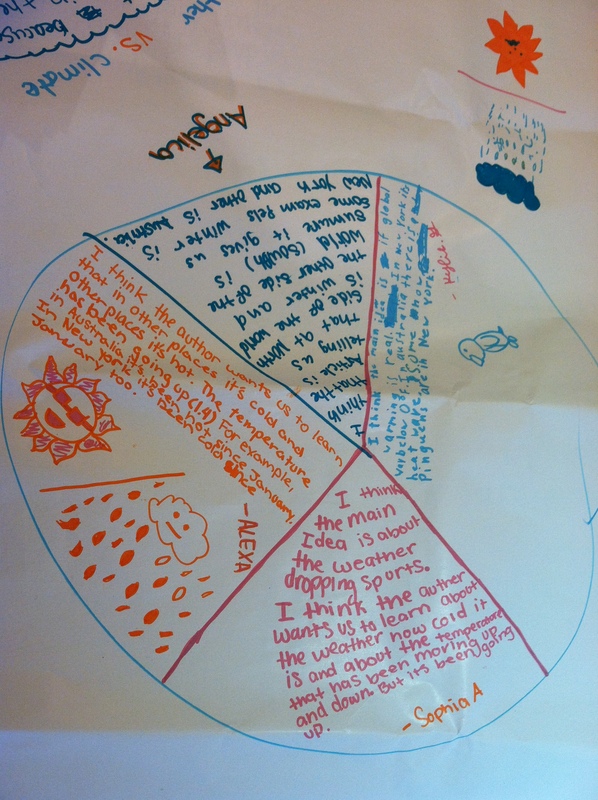 Love this activity, Julieanne – I am sure that last group learned so much from just comparing notes. And – hooray for the rain! So welcome, I am sure. Love this, Julieanne! We’ve been working to incorporate more writing like this into our instruction. As you point out, the markers alone bring up the level of engagement! And I agree with Leigh Anne about that word “yet.” It’s full of possibility, isn’t it? Thanks for sharing! It may be your first month as a daily slicer, but you have been perfecting the craft on a weekly basis for the last few months. Your storytelling is fabulous and ALWAYS has that touch that lets me know it is you – “YET!” is but one example of your strong voice! Thanks for your encouragement on the “slicing” journey; I am so looking forward to seeing you at the Reading Institute! 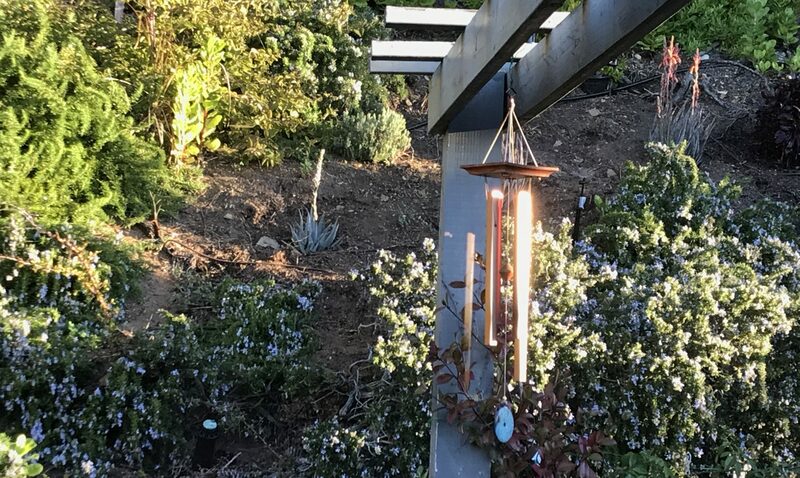 There is something so wonderful about the face to face connections after time spent together in twitterverse and the blogosphere! Weather – sounds like a topic old Englishmen would talk about, but it was so much more in your slice – surprise, joy, reading, learning, writing.